1889 was the year that John Anderson left his hometown of Varberg Sweden for the second time. In the late seventies, during his youth, he had spent some time in the United States. This time he would take his wife and three sons, just prior to Christmas, to Denver, Colorado looking for a new beginning. After spending a few years working in a smelter John decided to move to the fresh air of Washington and began working as a lumberjack. By 1906 his family had grown to eight, but life was difficult and their living conditions left much to be desired. John had heard of the opportunities available for people in Alberta and decided to join some of the folks that were heading north for a better life. He spent most of the summer of 1906 checking out the opportunities of obtaining a homestead. He liked what he saw along the Strawberry Creek and was impressed by the feed he saw growing. He wrote back to his son Oscar and advised that he put in a land claim on SE 14-49-3-W5. That land claim would be the first in the township which today contains the Village of Warburg. John stayed in Alberta working during one of the worse winters on record for a lumber camp at Genesee in 1907. That spring John headed for Washington to collect his family and returned after he and his two oldest sons had laid claim to the remaining three quarters of section 14. Upon their arrival only three miles had been graded west of Leduc and then it was one mud hole from Leduc to Pokehassett! A settler’s trail went as far as three miles west of Telfordville and the Andersons then had to cut nearly another eight miles of trails to reach their homesteads. 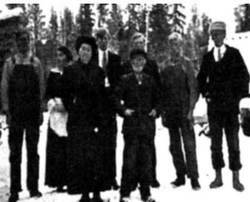 The Benson family from Varburg Sweden soon joined the Andersons and together with others cut a trail from Strawberry Creek to where the current Highway 39 was built. People that were drawn to the area in 1907 were handed information stating that the railroad would soon be coming and eventually it did twenty-one years later in 1928. In the meantime the homesteaders needed supplies and Anderson had a team of oxen. For eleven years Anderson would use his team to haul supplies from Leduc for his neighbors. The team became known as the Pokehassett Express! John’s son Oscar eventually sold the original homestead and bought his brother Peter’s farm and in 1950 sold it to his sons and moved to Calmar. Oscar helped establish Calmar’s Senior Drop-in-Center where he could be heard telling the youngest about the five-day trip the Pokehassett Express took to bring in supplies from Leduc. Oscar died in 1974 at the age of 85. In 1916 when it came to name the local post office, Anderson and Benson suggested their hometown of Varberg Sweden. The official listening to the families mistook the V as a W and thus Varberg was lost in translation and became Warburg. It was not until the railroad was completed in 1928 that Warburg would see any meaningful growth. Within a short time an elevator was built and then the post office was moved into the hamlet along with a blacksmith shop, hardware and grocery store. By 1934, a hotel and café were up and running. In 1954 Warburg population had grown to village status and continues to attract people today that are interested in agriculture and natural resources. Interesting enough it was soon discovered that there was a Warburg, but it was located in Germany not Sweden. This thousand year old community sits along the Rhine River and like its Canadian counterpart depends on the land to provide for its citizens being rich in farming and forestry products.